Tag Archive | Today is the first of the three day Raghavendra Aradhane. These three days see a huge rush of devotees to Raghavendra Swamy temples all over the world. What is so special about these three days and how did it originate. 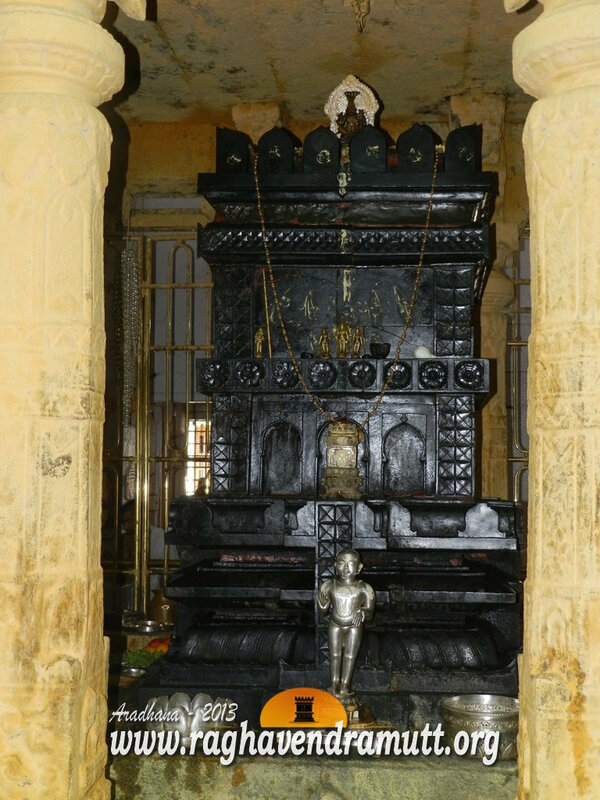 It is on Madhya Aradhane or the second of the three day celebrations that Raghavendra Swamy entered Brindavana. Normally, the second day is always a Thursday and, hence, Thursday is sacred to Rayaru. By the way, it was on a Thursday, more than three centuries ago when Raghavendra Swamy entered Brindavana in 1671 in Mantralaya. Initially, the Aradhane celebrations were conducted at the Nanjangud Matha near Mysore. It was only a few decades earlier that Mantralaya became the focus and the Mantralaya seers shifted base to Andhra Pradesh from Karnataka. Till the 1950s, the Brindavana at Mantralaya could be easily accessed and there was only a small railing to protect it. People could easily circumvent the Brindavana as there was no other structure adjoining it. It is only in recent years that the celebrations at Mantralaya are attracting world wide attention. While the preparations for the Aradhane at Mantralaya draws lakhs of devotes from all over the world, the Raghavendra Swamy temples in the rest of the country, nay the world, also make elaborate arrangements for these three days. The Brindavana is beautifully decorated and it is a sight to behold. Floral arrangements are made in the all the mathas which witness serpentine queues. The entry of Rayaru into Brindavana has been written extensively and generations of people, numbering crores, have read with tears in their eyes, the last days and last hours that Rayaru spent with human beings in Mantralaya. However, what many do not know is that there is no contemporary account of the epoch making event. All accounts of the days of Rayaru just before he entered Brindavana have come to us only years later. One of Rayaru’s closest disciples, Appanacharya, was not present when Rayaru entered Brindavan. He reached the Brindavana after Rayaru had already entered into the Brindavana and it is here that we have the first beautiful composition on the Mantralaya sage. The Poornabodha is a outpouring of complete devotion and it is the first ever such composition on Raghavendra Swamy. Appanacharya began the composition even as he began swimming from Bichale to Mantralaya. He began composing the song extempore even as he started swimming in the swirling waters of the Tungabhadra towards the final resting place of Raghavendra. What makes this composition all the more sacred is that Raghavendra Swamy himself is said to have completed it by uttering the last few lines from the Brindavana. One of the most authentic works on Raghavendra Swamy is a book by the same name called Raghavendra Vijaya. This is supposed to be the closest biography of the great seer as we could ever get. It is penned by Nayaranachar, the son of Raghavendra Swamy’s sister. So, this would make him Rayaru’s nephew. What makes this book all the more appealing is that it was endorsed by Raghavendra Swamy himself. Another scholarly work is Gurugavanastavana, penned by the great grandson of Rayaru himself. Known as Vadeendra Theertha, he was one of the pontiffs of the Sri Raghavendra Swamy Matha. Vadeendra was just two years when Raghavendra Swamy entered Brindavana. Vadeendra was the son of Purushottamacharya, who in turn was the son of Lakshminarayana, the son of Raghavendra Swamy. The Gurugavanastavana too received approval from Raghavendra Swamy himself when Vadeendra read it our before the Brindavana in Mantralaya. The Brindavana shook from side to side as if giving approval to the work. The bard of Mantralaya is the most written among saints. There are thousands of books on him, his miracles and his life and times. There are also hundreds of blogs and articles. A few other books are by Korti Sreenivasa Rao, Raghavendra Darshanaa: Glimpse of Sri Raghavendra Tirtha : Saint of Mantralaya by Prof. Vyasanakere Prabhanjanacharya and a History of the Dvaita School of Vedanta and its Literature, Dr. B. N. K. Sharma. By the way, Suyameendra Teertha Swamy, the earlier pontiff of the matha, commissioned the Gurucharitre, to come up with the origin and history of the Sri Raghavendra Swamy Mutha. Dr. Huli. K. Vedavyasacharya, the poorvashrama son of Suvrateendra Teertha, took up the project along with his brother in-law Raja S. Gururajacharya and brought out the Gurucharitre. This book too has excellent details on Raghavendra Swamy. Several films too have been made on Rayaru. In Kannada, Srinath and Dr. Raj Kumar have acted in films made on the saint as has Rajnikanth in Tamil. A Telugu film too has been made on Rayaru. Serials have also been telecast at regular intervals on the life, times and miracles of the Mantralaya seer. The song, “Endu Yenega Govinda” was penned by Raghavendra Swamy himself and it is one of the most sung compositions of all times. Another song, composed in his previous avatar as Vyasa Raja or Vyasa Theertha, is “Krishna Nee Begane Baro”. This too is among the most popular songs and it is a must before or during every dance performance.